When Hallmark viewers tune in to the Home & Family TV show tomorrow morning, it’s a safe bet that they won’t see Mark Steines as co-host. The cable channel has released a statement that they have parted ways with Steines. His bio has already been removed from the Home & Family portion of Hallmark’s website. Read an update here. 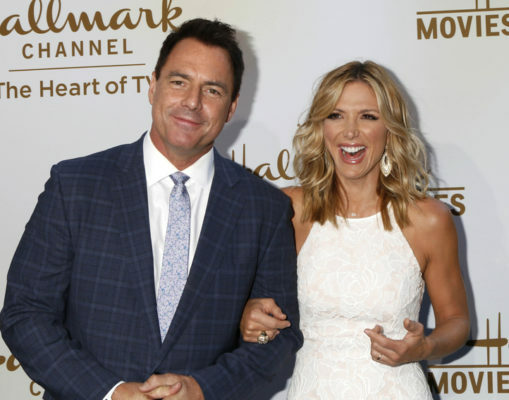 Today Hallmark Channel has parted ways with Mark Steines as the co-host of the network’s lifestyle series “Home &Family.” We are extremely grateful to Mark for his incredible work and wish him all the best success in his future endeavors. A former correspondent and substitute anchor on Entertainment Tonight, Steines helped launch the current incarnation of Home & Family in October 2012. Paige Davis was his first on-screen partner. She was replaced by Christina Ferrare a month later. Debbie Matenopoulos replaced Ferrare in 2016 and now, it appears Matenopoulos is the show’s sole host for the time being. It’s unclear what caused Steines to leave the program so abruptly but, with the current climate in the industry, one can guess that we haven’t heard the end of this story. It may be something as simple as May 2018 was the end of his contract. When Ferrare was replaced, there was little acknowledgment. Steines hasn’t made any updates to his social media accounts or website. His Instagram post on Memorial Day indicates that all was well on the Home & Family set. What do you think? Will you miss Steines as co-host of Home & Family on Hallmark? Will you still watch the program? I stopped watching Home and Family when they let Cristina go. I never was a fan of Marks. I feel he needs to act his age on the show and in his personal life ! ! ! ! I am not a fan of Debbie. I will probably never watch Home and Family again. I think the way Mark Steines was “released” from HM H&F was very non-professional. I am truly dismayed that Mark will no longer connected with H&F and I have serious concerns about the Hallmark Leadership. On another note: I’m in my seventies with a small frame and I don’t think every female co-host has to be tall, thin and glamorous. I hope Hallmark leadership will rethink the H R policy for future changes. I remain hopelessly addicted to all the HM movies. I hope there are plans to feature Paul Green and Cameron again soon. I miss Mark Steines being on the show. It just not the same with him gone! Just when I get into a show like this there is a bunch people changes, I lose interest in the program! Cristina did not leave because she had cancer! They fired her without notice. She found out a couple months after she was fired that she had cancer.